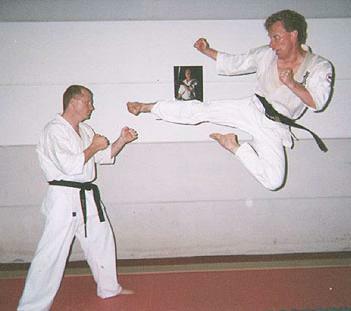 Shihan demonstrating a tobi yoko geri with one of his former students, Sempai Neil Madden. Doug Turnbull started training in Kyokushin in 1971 under the then Sensei John Taylor (now 9th dan) . He attained shodan in 1975, nidan in 1980, sandan in 1985, yondan in 1990, and godan in 1996, and in 2006, Hanshi Arneil awarded him rokudan. The first 4 grades were obtained under the banner of the Australian Kyokushin Karate Association (AKKA) which was at the time still affiliated with Sosai's IKO in Japan. The latter 2 were obtained under Hanshi Steve Arneil's International Federation of Karate. He has been teaching karate since 1976, and founded his own dojo in Marrickville in 1982 at which he still teaches. He attained an International Referee's certificate, which is for full-contact kumite, is accredited for non-contact kumite, including mirror judging, Kyokushin kata judging, and, while the Federation of Australian Karatedo Organisations (FAKO) still existed, had a "C" level FAKO accreditation as a judge. (The organisation has since been restructured and renamed as the AKF (Australian Karate Federation). He attainded a Level 4 accredited National All Styles (NAS) referee, and was voted Best and Fairest Official for NAS NSW for 1999 and 2000. In AMAC he is a level B judge and referee. Beginning 2007, Shihan Turnbull resigned from the NAS circuit and, together with Shihan Peter Mylonas (Kempo Ryu Karate), they formed the Australian Martial Arts (AMAC) tournament circuit. His competition experience includes a first place in the NSW kumite championship (quite an achievement for a man of his stature in the days before weight categories), and two kata first place titles (one at State and the other at National level). On the administrative side, he was on the judging panel for the State Senior Gradings during 1994 and 1995, and has been a Tournament Organising Committee member since 1983. He was Editor-in-Chief of "SHIN", the national Kyokushin magazine, from 1983 to 1987. He was also Junior Vice Chairman for the New South Wales AKKA from 1990 until it split up in 1994, and is currently Chairman of the IFKKA. He has also had the good fortune of training at Honbu dojo in Japan.